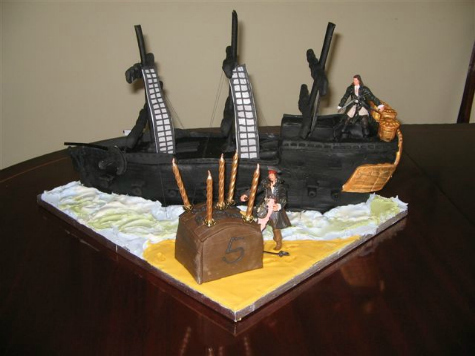 My mother once made the best pirate ship birthday cake I have ever seen, for her grandson. It was so good that I want to share the recipe with you, and I have managed to persuade her to write it down. If you are making a novelty shaped cake, Medeira cake is ideal. It can be carved and will keep for up to two weeks. I used a lined 20cm (8 inches) square cake tin. To test and make sure your cake is cooked, poke a cocktail stick in the middle of the cake and if it comes out clean, then it is cooked. Let the cake cool and then cut in half. Wrap both halves in foil and freeze. You will find the cake a lot easier to carve and shape when frozen, and you'll get nice clean edges too. You will need about one and a half of the two lengths of cake for the main body of the pirate ship. The rest of the cake can be used to raise up the levels (mainly at the back). I used apricot preserve to stick cake to cake AND icing to cake. Thick liquorice sticks for the masts. Little pirate figures. They are of course from Pirates of the Caribean (as is design of the Pirate Ship birthday cake) but any pirates will do. My grandson loved the figures and of course they were left when the cake had gone. Sails were shaped from a little of the black sugarpaste. Lights - shaped by hand using a little of the white sugarpaste, dust with gold powder. These can be as simple or as detailed as you wish. Anchor, Guns and Gun Holes, Barrels and Hatch - all moulded and cut by hand and again can be as detailed as you wish. I covered the board with blue and white royal icing to give a sea effect and made a treasure chest for the candles, then placed it on a yellow sandy area. I tied thread to each side of the masts and pinned it to the board, ( under the icing ). It gave a good effect and supported the masts. I used apricot preserve to cover the cake before putting on the icing, this helped the icing to stick to the cake and tasted good too. Once the cake is completely covered, a little water was all I needed to stick the icing to icing. I used straight pins while waiting for the icing to dry and stick... YOU MUST REMEMBER TO TAKE THESE OUT when dry.